The following article by Rabbi Dr Raymond Apple first appeared in The Jewish Bible Quarterly, June 2012 (Vol. 40, No. 3, Issue 159). People wax lyrical when they describe the Psalter. Rowland E. Prothero calls it “the whole music of the heart of man”. Solomon B Freehof’s view is: “The Psalms embody the highest ideas of biblical literature… (with) a uniqueness of mood and expression.” WOE Oesterley calls the Psalms “poetry and religion… hand in hand”. Over and above psalms that seem to make music, there are – scattered through the Book of Psalms – Wisdom poems which neither praise, celebrate, nor even complain, but reflect on the meaning of life. Their themes – righteousness, reflection and resolution – are typical of Wisdom literature as a whole. We recognise Wisdom psalms by their vocabulary (wise, happy, blessed, good), by their contrasts and comparisons (especially the wicked as against the righteous), and by their themes (for example, the benefits of practical morality). Their authors are philosophers as well as poets. They weave together the spiritual quest and the search for moral foundations. These psalms join the books of Job, Proverbs and Ecclesiastes as examples of Wisdom literature in the Bible. There may have been a feeling that the Book of Psalms should begin with aleph – the first letter of the alphabet. The Midrash (Gen. R. 1:10; cf. Chag. 11b) states that the Torah itself would have begun with an aleph had a bet not have been preferred for theological reasons. Later the Decalogue (Ex. 20:2, Deut. 5:6), does open with the aleph of anochi, “I”. Chronicles, retelling the history of mankind from the beginning, begins with a large aleph. Even if it was considered significant that Psalms begin with the letter aleph, this does not yet explain why the specific word chosen was ashrei. According to Yalkut Shimoni on the first verse of this psalm, David, the traditional author of Psalms wanted to begin his book where Moses had left off in the Torah. Moses said, Ashrecha Yisra’el (Deut. 33:29); here David begins ashrei ha’ish. However, it seems that there is a more fundamental reason to begin Psalms with ashrei. This psalm is a Wisdom poem, and beginning the Book of Psalms in this way, prioritising a Wisdom poem, bolstered the case for the hacham, the sage and scholar, as against the chasid, the holy pietist, placing study and contemplation above cultic and private devotions. It may have been part of an ancient struggle to define the ideal Jewish type. This is not necessarily a revolt against religion but a debate within it. Wisdom and piety are both important, and the question is which has priority. The rabbis assert, An ignorant person cannot be pious (Mishnah Avot 2:8), wisdom is the path to piety. The happy man of Psalm 1 chooses a life in the Torah (verse 2), studying it in both his active and his restful hours: He contemplates his Law day and night. According to Rashi’s commentary the “his” refers in the first instance to God, but once the happy man engages with the Torah it becomes his own. We presume he prays and follows regular pietistic practices, but his real priority is his study of God’s word. Happy is the man is probably the most common English rendering of ashrei ha’ish. Ashrei appears to denote the contented state of being that comes from the directed life. The root of ashrei is aleph-shin-resh, which opens up an array of possible connections with words featuring the same root. Rashi, supports the linking of aleph-shin-resh with ashur, meaning a step. He notes that Psalm 1:1 uses a series of verbs connected with stepping or moving: walk, stand and sit. Complementing but complicating this approach with questionable etymology, Samson Raphael Hirsch translates ashrei ha’ish as “forward strides the man”. Aleph-shin-resh thus connotes action, not a mere state of being. This approach is found elsewhere in the Bible, for example: al te’asher b’derech ra’im, “Walk not in the way of evil men” (Prov. 4:14), ish’ru b’derech binah, “Walk in the way of understanding” (Prov. 9:6), and ash’ru hamotz, “Straighten the oppressed” (Isa. 1:17). This would indicate that the happy man of this psalm is a man of action. What sort of activities is he engaged in? Some psalms are more emotional and spiritual, with heroes who throb with emotion, with ecstasy as well as agony. Psalm 16:11, for one, speaks of sova s’machot et panecha, “Fullness of joy in Your presence”, and ne’imot biy’min’cha netzah, “Bliss at Your right hand for ever”, but it does not use the word ashrei. Psalm 1 does not rule out a happy man bounding with delight, but the more probable picture is a man who is calm and at ease, content with values that have brought him stability and well-being: a state of mind, not an excited “high”. It is not his heart which rejoices as much as his mind and soul. He has chosen the path of wisdom. His happiness is a state of being. Isidore Epstein explains that the happiness in this psalm is not ecstatic, but rather indicates a life of “inspiration and consecration, a call to service and action – the doing of righteousness”. For Martin Buber, Psalm 1 is the paradigm of the man often delineated in Wisdom literature. Buber’s notion of ha-ish is more active than Epstein’s vague characterization of “the doing of righteousness”. For him, the message of Psalm 1 is that the happy man has a “way”, a direction, which brings him benefit – all that he does shall prosper – whilst the way of the wicked peters out (toved). Happiness is the reward given for attaining righteousness: in most cases, a set of values chosen by the recipient (generally an individual but sometimes the people as a whole). Some values are ethical (charity, justice, etc.). Others are spiritual (atonement, piety, etc.). Like the happy man of Psalm 1, the recipients of Divine blessing keep away from evil and contemplate the Divine law. The common thread is, in Buber’s terms, that they lead directed lives. What is their happiness? Not singing and dancing, not ecstasy and excitement, but contentment and satisfaction. In rabbinic Hebrew aleph-shin-resh means to confirm, attest, validate, as seen in the Talmudic saying, Hav’rach mit, asher (with an aleph); it’ashir (with an ayin), lo te’asher – “If people say your friend is dead, credit it; if they say he has become rich, don’t credit it” (Gittin 30b). The happy man lives a validated life, a life of substance and activity. SUMMARY: HA-ISH AS A REAL PERSON? The Midrash on Psalms wonders whether the happy man of Psalm 1 is a mere typology or a real person. Anachronistically, it identifies him as King David, whom it sees as a Torah sage: rabbinic thinking often depicts biblical figures as rabbis and claims the prophets as halachists. Midrashic literature proposes other biblical characters as candidates for the happy man in this psalm. However, it is more likely that the happy man is not any particular individual, but a type. Wisdom literature seems more interested in moral philosophy than history. The first psalm is a description of the haapy, content and thoughtful man often portrayed in Wisdom literature. 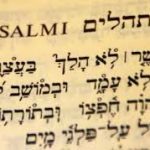 The Talmud (B’rachot 9b/10a) teaches that Psalms 1 and 2 were originally one. Psalm 1 begins and Psalm 2 ends with ashrei. Both speak of the wicked perishing in the way. Both believe that God and the righteous will finally prevail over the opposition of the wicked. 1. Rowland E. Prothero, The Psalms in Human Life (London: John Murray, 1903) p. 1. 2. Solomon B. Freehof, The Book of Psalms: A Commentary, (Cincinnati: UAHC, 1938) p. 3. 3. WOE Oesterley, The Psalms (London: SPCK, 1962) p. 1. 4. Brown, Driver & Briggs, Hebrew and English Lexicon of the Old Testament (Oxford: Oxford University Press, 1957 ed.) p. 80. 5. Samson Raphael Hirsch, The Psalms, English trans. Gertrude Hirschler, Jerusalem/New York, 1978, p. 1; Hebrew trans. Yechi’el Ze’ev Lipschitz, (Jerusalem: Mossad HaRav Kook, 1961) p. 15. 6. Isidore Epstein, “The Psalms and the Modern World”, Jewish Affairs (Johannesburg: South African Jewish Board of Deputies, September 1952). 7. Martin Buber, Right and Wrong: An Interpretation of Some Psalms English trans. Ronald Gregor Smith, (London: SCM Press, 1952) pp. 53-62. 8. ZH Chajes, Student’s Guide Through the Talmud, trans. J Schachter (London: East & West Library, 1952).